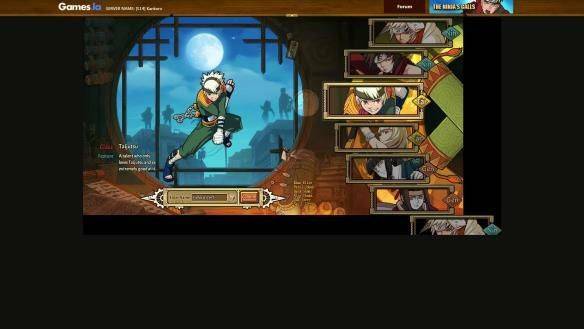 Set in the Naruto manga and anime series universe, Ultimate Naruto is a free-to-play anime themed browser MMORPG developed by Bingyou Animation Co. Ltd. The game combines anime-based plotlines, intense combats and a pure Japanese anime style, and gives players the chance to be a ninja who have to lead a team of 10 ninjas based on the original Naruto universe to form their own path to become the most powerful and feared ninjas. In Ultimate Naruto you can choose to be a male or female ninja (male ninjas tend to have more physical strength and the female ninjas tend to have a greater knowledge of the secret techniques) member of one of the three ninja schools that the game offers. These three schools are the Taijutsu School focused on the use of hand-to-hand combat, the Ninjutsu School centered on the knowledge of all the ninja techniques and the mysterious Secret Jutsu School that teaches how to have an immortal body. The game allows players to equip their ninjas with 6 different types of gadgets and equipment which are classified by rarity: white is common, green is uncommon, blue is rare, purple is epic being red and gold the most rare and powerful armor and weapons. The game also includes a forging feature that allows players to create their own equipment, which can be enhanced and upgraded using Fortify techniques. In Ultimate Naruto quests and missions are assigned by various NPCs from the Naruto world. There missions are classified by main tasks, mandatory for story progression, sub tasks that provide additional rewards and daily tasks. Ultimate Naruto also includes some PvP features like Arenas where players gather to test their ninja skills, and features guilds which allow players to form powerful ninja clans.